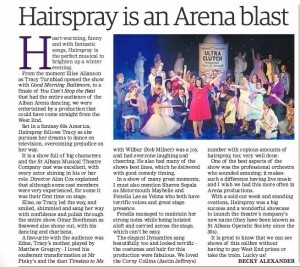 “… a premium production, that was exceedingly well done; I loved the show … such an iconic musical, with lots of fun, … good musical numbers, performed well … the car worked extremely well, and got a round of applause both nights I saw the show! Congratulations to everyone involved for taking on such a large project and delivering it to such a high standard”. 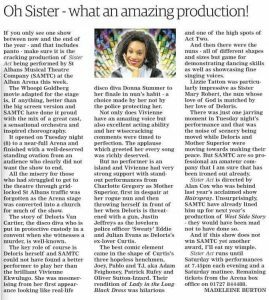 “A fabulous show, perfect casting, brilliant vocals and a real glitter-fest. Doubled up laughing one moment and wiping away a tear the next. What more can you ask for from a nights entertainment.”; “… amazing performance … haven’t had such a fun night out in ages”; “… just wish I’d booked to see it a couple more times during the week”; “what an utterly fabulous performance tonight … loved it!”; “What a fantastic show. A phenomenally exhilarating and uplifting example of the best of musical theatre”. “…..completely engaged from the beautifully choreographed, well-danced prologue, to the stillness and drama of the bows …….some wonderful dance numbers and fight scenes, it brought the whole musical to life, …… With so many named parts it is not possible to mention everyone, but suffice to say there were no weak links ….. a superb production”. “If you only see one show between now and the end of the year – and that includes panto – make sure it is the cracking production of Sister Act being performed by St Albans Musical Theatre Company (SAMTC) at the Alban Arena this week”. ” The absolute best ‘amateur’ production I have ever seen (and I have seen a lot! )” “Sister Act, you blew my mind tonight”. “Nothing short of amazing, we loved it”. “Absolutely outstanding”. “Still smiling from last night’s show, well done, very funny, very entertaining and so uplifting”. 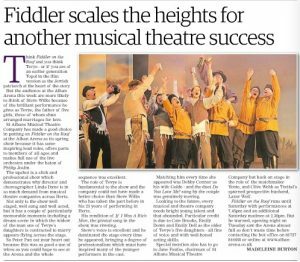 “Superb production, brilliant choreography, first class band and such a talented cast”.